The Killjoy won the Scottish Arts Council Book Award for 1986, and was recommended for the David Higham Prize for Fiction. When my daughter was four, we went off to America for seven years because of my husband's job. By the time we came back, our stable, almost unchanging babysitting cooperative of other families with young children had been turned upside down. Divorces, remarriages, chaos. I became fascinated by the nature of passion - how people could suddenly choose to risk all the stability they'd created around themselves and those they loved, simply in order to feel fully emotionally alive again. Up until then, I'd been perfectly happy writing novels for older children, but this was clearly a subject to be explored at an adult level. The book become darker and darker in the writing. I didn't realise how dark until the first review came in: "a horror story which rings absolutely true". But that is passion for you. It's dangerous in every way. 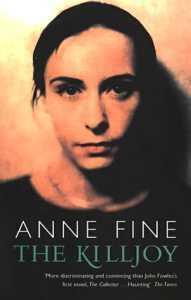 "More discriminating and convincing than John Fowles' first novel, The Collector ... Haunting"
"Definitely not one for the faint-hearted. It's compellingly written, sinister... and very, very fine"
"Powerfully done... reveals an accomplished and ambitious writer"
"A novel with an adder in the prose... observant and impressive"
"A wonderful and original piece of work - impeccable from beginning to end ... a horror story which rings absolutely true"
The Killjoy , a novel for adults by Anne Fine, was first published in 1986. It has been issued several times in paperback, most recently by Black Swan on 28th February 2011: order it now from Amazon or from any bookshop or library, quoting the ISBN 978-0-552-77764-3. Now also available for Kindle (from 1st September 2014). The Killjoy has been translated into French and German.